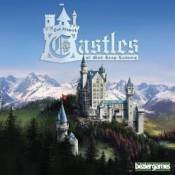 In the tile-laying game Castles of Mad King Ludwig, players are tasked with building an amazing, extravagant castle for King Ludwig II of Bavaria...one room at a time. You see, the King loves castles, having built Neuschwanstein (the castle that inspired the Disney theme park castles) and others, but now he's commissioned you to build the biggest, best castle ever � subject, of course, to his ever-changing whims. Each player acts as a building contractor who is adding rooms to the castle he's building while also selling his services to other players.